James Langdon (1755 - 11/1835) married Patty Stevenson, daughter of Soloman & Sarah Stevenson, on 9/13/1778 in Johnston County, North Carolina. James and Patty raised 9 children, 7 daughters and 2 sons. After Patty's death, James married Catherine Beaman in 1815. 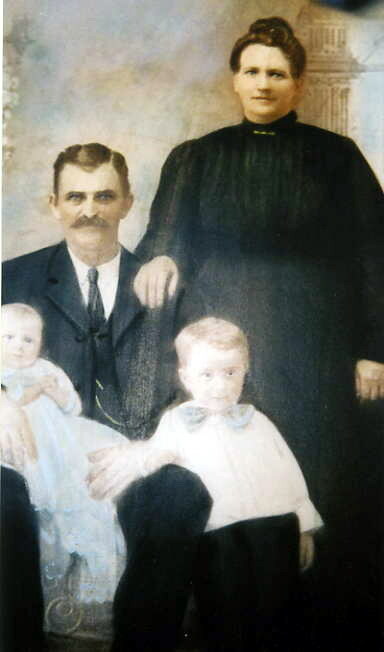 James & Catherine, along with several of James & Patty's children, migrated to Owen County, Indiana. The oldest of James & Patty's two sons, Zachariah, went to Indiana with his father while the younger son, Britton, remained in North Carolina. Blanche Elizabeth Beaman ca. 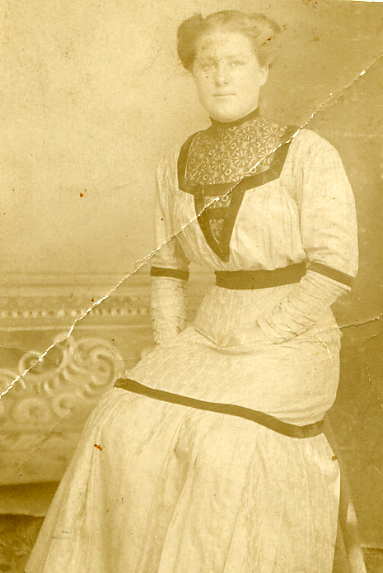 1915 Daughter of Emmett & Marguerite Haynie Beaman and great-great-granddaughter of James & Patty Stevenson Langdon. Emmett & Rufus Beaman ca. 1946 Emmett (3/14/1878 - 8/7/1949) was the son of Bryant Beaman & Dicy Ann Lucas and the great-grandson of James Langdon & Patty Stevenson. Rufus (8/10/1900 - 5/13/1981) was the . Emmett & Maggie Beaman Family ca. 1912 (L -R) Marguerite (holding Howard), William Everett, Rufus Henry, Orval Alma, Emmett, and Blanche Elizabeth. 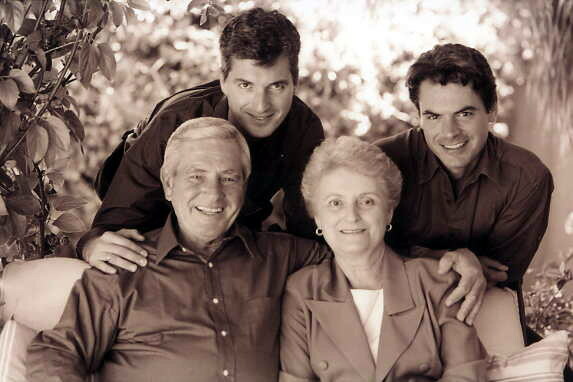 Emmett Beaman Family ca. 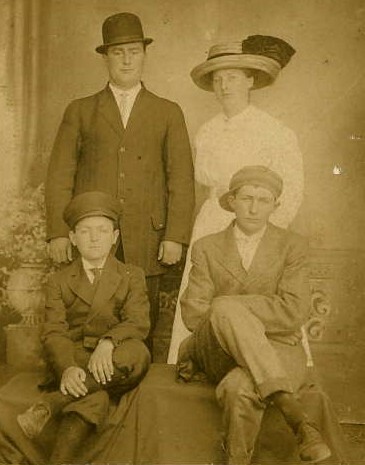 1912 (L -R) William Everett, Orval Alma, Emmett, Blanche Elizabeth, Margaret "Maggie" Mae (holding baby Howard), Rufus' mule, and Rufus Beaman. Rufus Beaman ca. 1904 Son of Emmett & Marguerite Haynie Beaman and great-great-grandson of James & Patty Stevenson Langdon. Rufus & Ruby Jones Beaman ca. 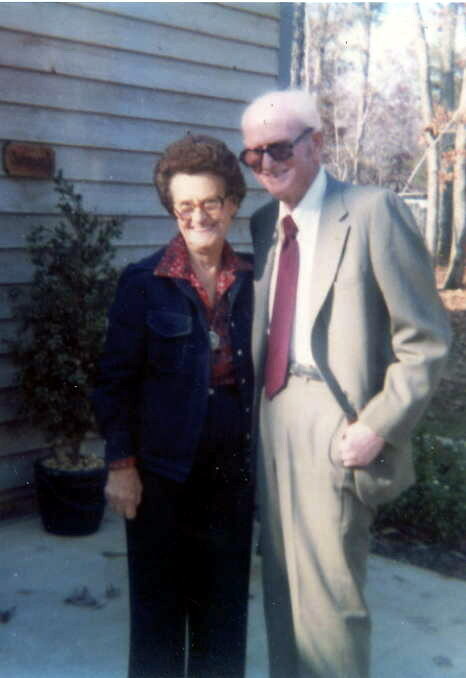 1945 Great-great-grandson of James & Patty Stevenson Langdon with his wife, Ruby. William Clark Langdon Family ca. 1896 Son of Zachariah & Rachel Bolin Langdon. Grandson of James & Patty Stevenson Langdon. Front (l-r): Henry, William, John, Mary, Robert. 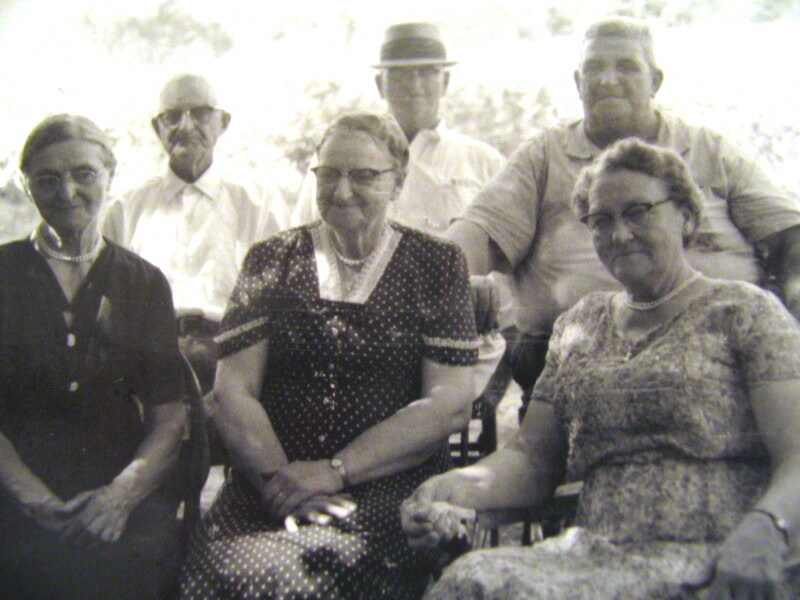 Rear (l-r): Cornelia, Julia, Joseph, Charlotte, Naomi, (William Ira Langdon not pictured). Zachariah Langdon Land Grant 1848 Land Grant for 40 acres of land in Vincennes, Indiana. Britton Langdon, Sr. (9/7/1792 - 1/1876) was the son of James & Patty Stevenson Langdon. He married Margaret "Peggy" Carroll, daughter of James & Rhoda Stephenson Carroll, on 11/7/1815 in Johnston County, North Carolina.  They had 7 children before Peggy died on 5/24/1836. Britton then married Winifred Hawkins Jordan on 8/5/1836 and they had 4 children together. Carroll & Nancy Byrd Langdon ca. 1890s Son of Britton Langdon, Sr. & Margaret Carroll Langdon. Daughter of Lemuel & Zada Matthews Byrd. From James Bryan Creech Collection - Johnston County Heritage Center. Lemuel "Lam" & Margaret Lassiter Langdon ca. 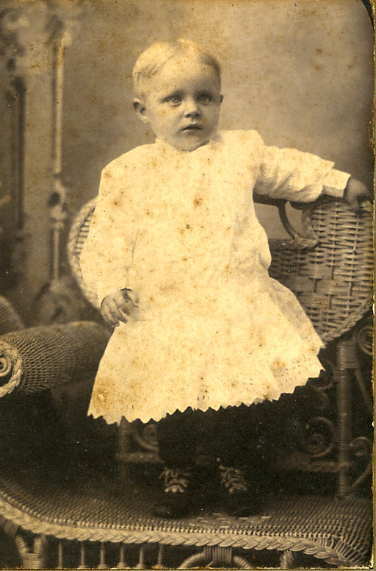 1890s Son of Carroll & Nancy Byrd Langdon. Daughter of Alfred & Dianna Lassiter. James Bryan Creech Collection - Johnston County Heritage Center. Carrie Langdon (5/23/1885 - 12/5/1968) was the daughter of Joseph Marion & Susan Elizabeth Denning Langdon. On November 8, 1903, she married Riley Melvin Pleasants (8/23/1879 - 8/23/1966) son of John & Margaret Cutts Pleasants. Together they raised 8 children. 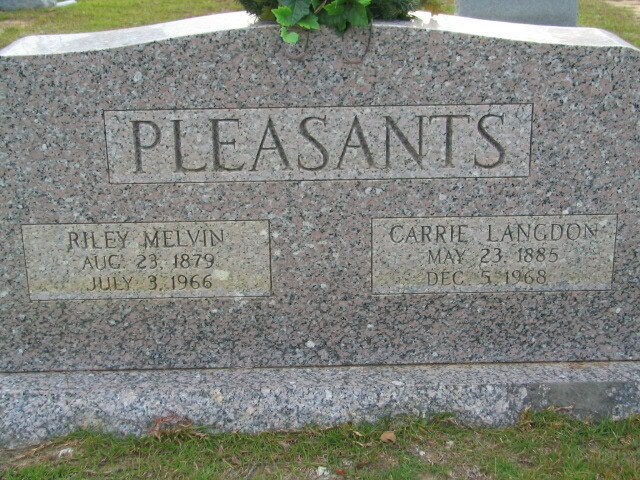 Carrie & Riley are buried at Bethel Primitive Baptist Church Cemetery, Johnston County, North Carolina. 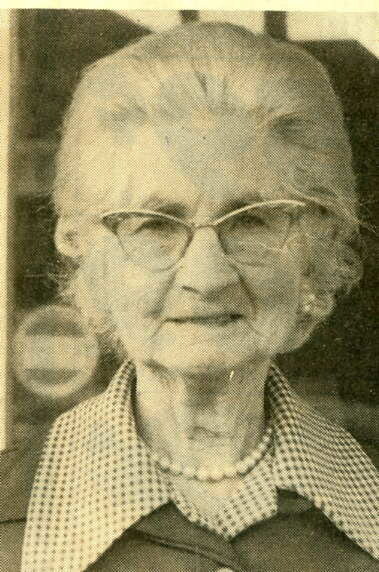 Ann Elizabeth Pleasants Blalock 1958 Granddaughter of Riley & Carrie Langdon Pleasants. Daughter of Jarvis Marion & Minnie Bertha Collins Pleasants. 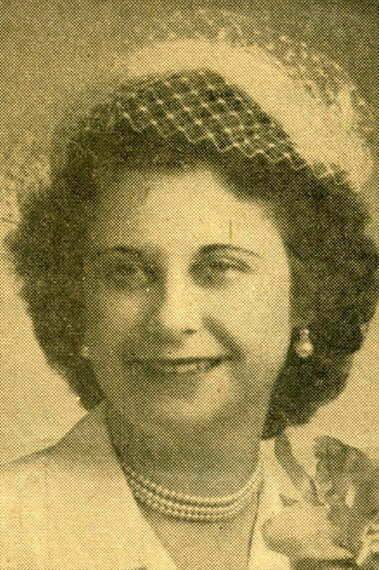 Wife of Donald Raeford Blalock. Jarvis Marion Pleasants ca. 1980 Son of Riley & Carrie Langdon Pleasants. Husband of Minnie Bertha Collins Pleasants. Minnie Bertha Collins Pleasants ca. 1991 Daughter of Dallas Fernando & Molissie Z. Kelly Collins. Wife of Jarvis Marion Pleasants. 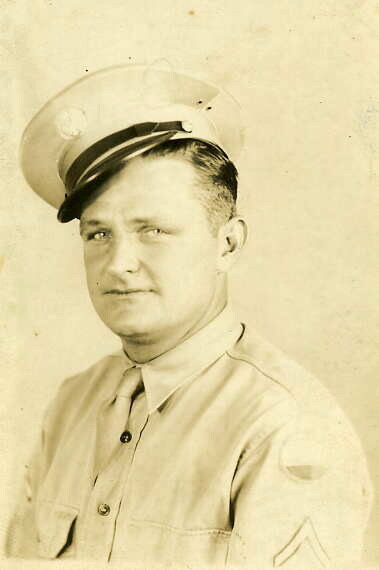 Dester Langdon (3/24/1900 - 3/30/1955) was the son of Joseph Marion & Sally Ann Cobb Langdon. He married Lector Corina Matthews (4/25/1922 - 12/2/1995), daughter of Augustun Ply "Guston" & Louisa "Peggie" Pleasant Matthews, on 4/22/1918. Together they raised 8 children. 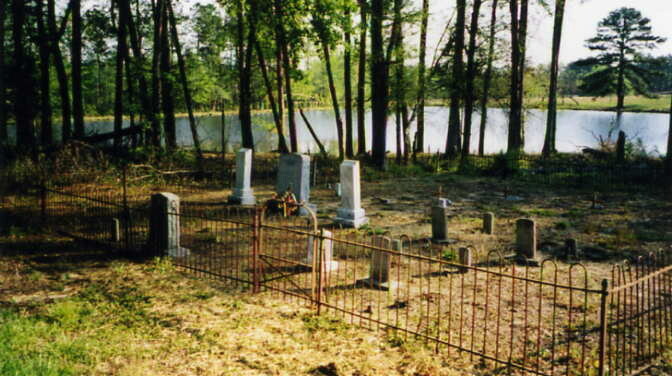 Dester & Lector are both buried in Harnett Memorial Park Cemetery, Harnett County, North Carolina. Danville & Devaul Langdon ca. 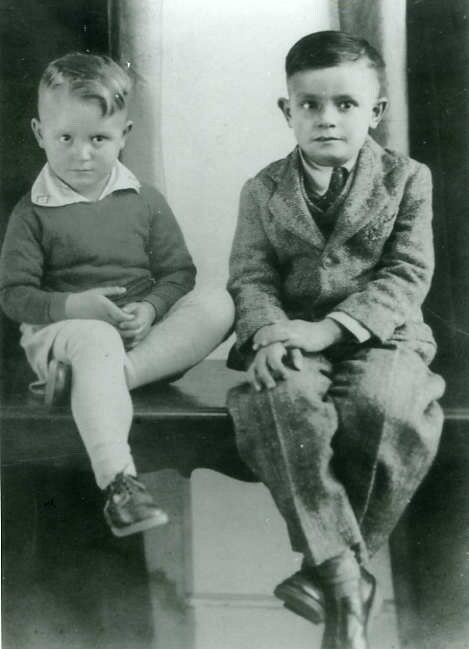 1930 Twin sons of Dester & Lector Matthews Langdon. Danville & Devaul Langdon ca. 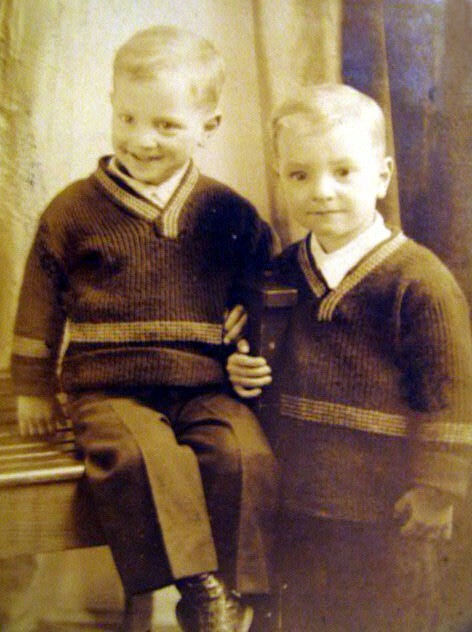 1934 Twin sons of Dester & Lector Matthews Langdon. Daywood Kent Langdon Son of Daywood Earn & Frances Kelly Langdon. Grandson of Dester & Lector Matthews Langdon. Don Ray Langdon Son of Dester & Lector Matthews Langdon. Drexal Alonzo Langdon Son of Dester & Lector Matthews Langdon. 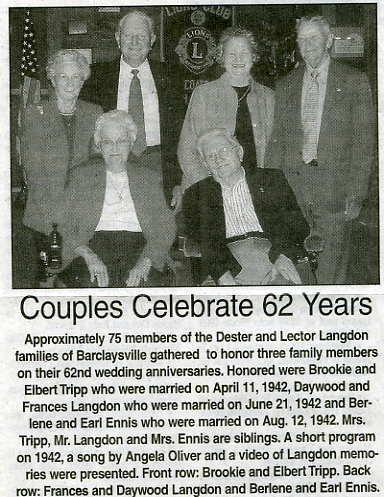 62 Year Anniversaries 9/2004 Three children of Dester & Lector Langdon celebrate their 62nd wedding anniversaries. Edith Ann Langdon (11/5/1856 - 4/25/1936) was the daughter of Britton Langdon, Jr. & Margaret Delaney Adams Langdon. She married Benjamin Franklin Young, son of Warren & Martha Sills Young. They had 9 children together. Bertie Frances Young ca. 1920 Daughter of Benjamin Franklin & Edith Ann Young. Bertie Frances Young ca. 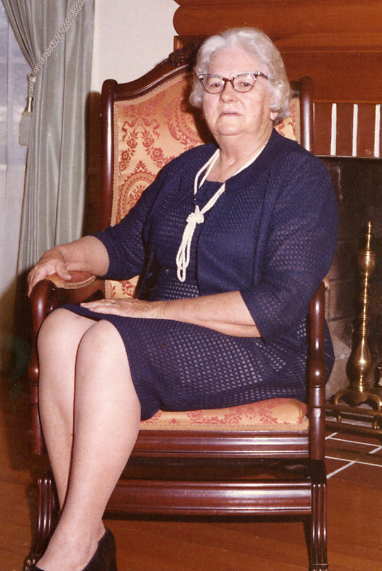 1974 Daughter of Benjamin Franklin & Edith Ann Young. James Allison Langdon (8/23/1883 - 11/23/1960) was the son of Joseph Marion & Susan Elizabeth Denning Langdon. On 3/19/1905, he married Ella Green McGee, daughter of Young & Catherine Johnson McGee. They had 1 child together. After Ella's death in 1908, Allison married Alice Pleasant, daughter of Joseph James & Sarah "Sallie" Stephenson Pleasant. They married on 2/24/1909 and had 11 children. James Allison Langdon ca. 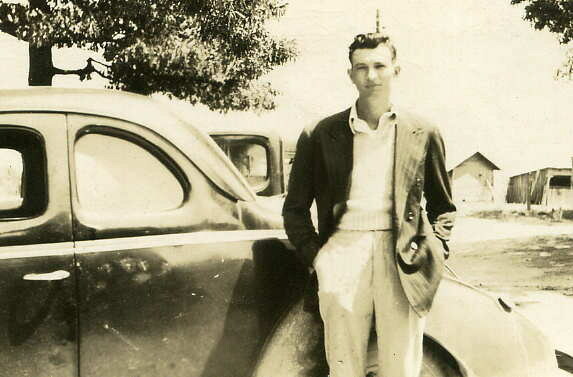 1942 Son of James Allison & Alice Pleasant Langdon. 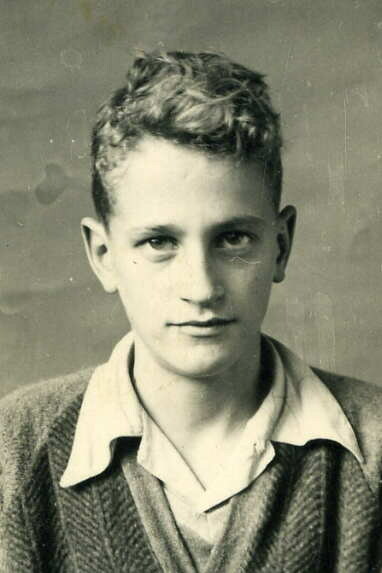 James Roy Langdon ca. 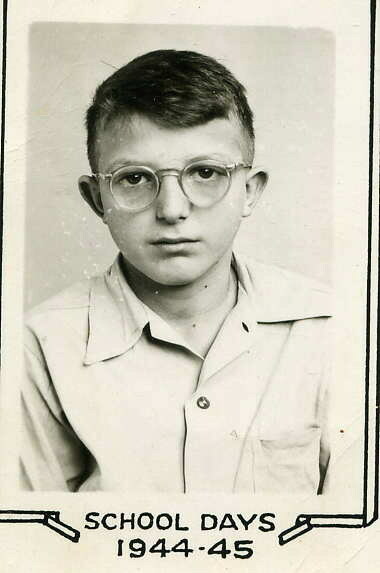 1942 Son of James Allison & Alice Pleasant Langdon. Husband of Elma Booth Langdon. Joseph Clayborn Langdon ca. 1908 Son of James Allison & Ella Green McGee Langdon. Merchant Langdon ca. 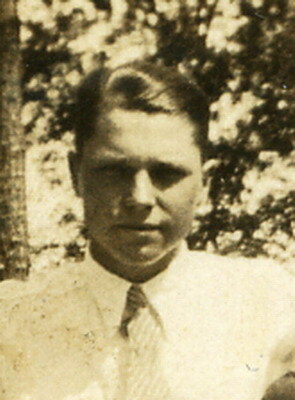 1935 Son of James Allison & Alice Pleasant Langdon. 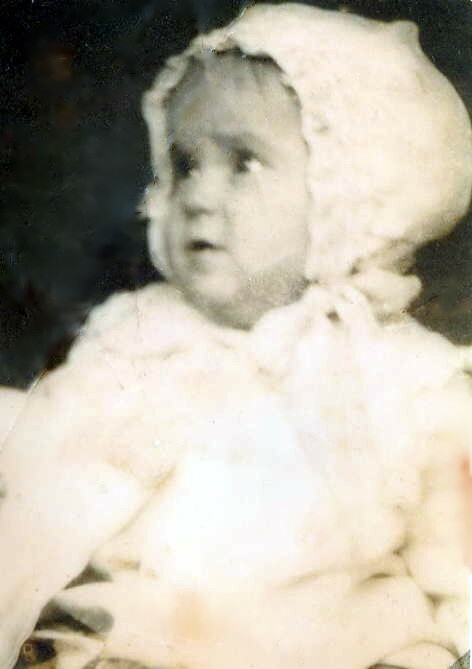 Joseph Marion Langdon (8/21/1860 - 5/17/1936) was the son of Britton Langdon, Jr. & Margaret Delaney Adams Langdon. Joseph's father, Britton, Jr., died of pneumonia on 4/10/1863, in Scottsville, VA, during the Civil War, leaving a wife and 2 small children. 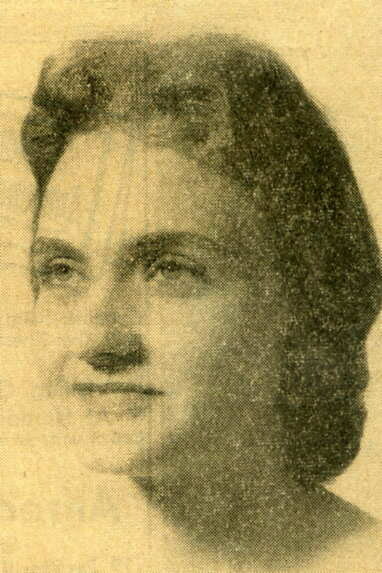 Margaret then married James D. Jones and had 2 more children. Joseph married Susan Elizabeth Denning, daughter of Joel Denning, Jr. & Mary Ann Gregory Denning, on 12/15/1881. They had 6 children together, the last of which died shortly after birth. Susan died 5 days later on 10/11/1894. 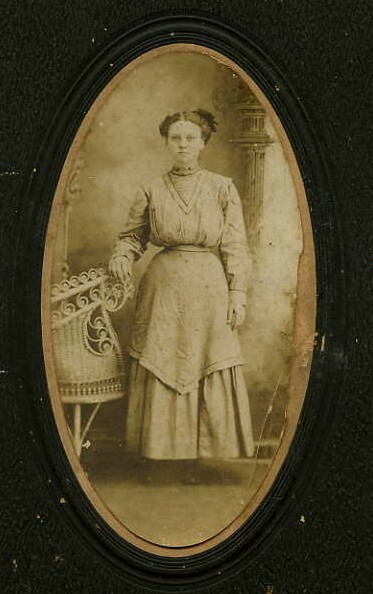 Joseph next married Sally Ann Cobb, daughter of Samuel & Emily Stewart Cobb, on 2/17/1895. They raised 6 children of their own. Their oldest child, Joseph Baxton Langdon, died of pneumonia at the age of 16. 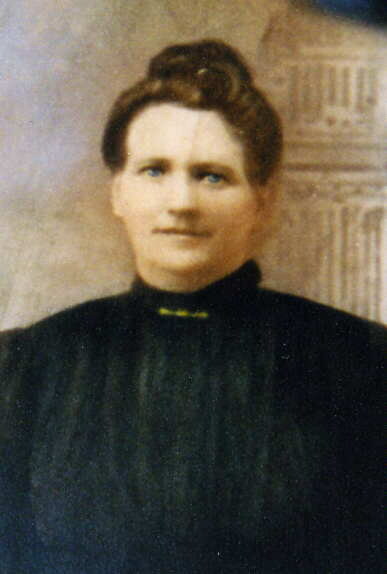 Sally Ann Cobb Langdon died in May of 1926. Joseph's third, and last wife, was Margaret Smith, daughter of Isaac Smith. Margaret outlived Joseph and died in 1945. She is buried in the Four Oaks Town Cemetery in Johnston County, North Carolina. 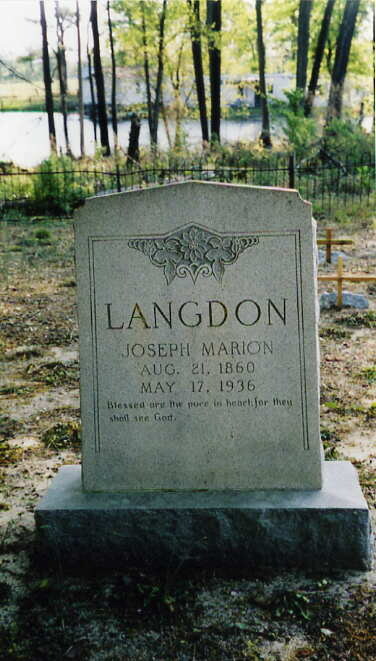 Joseph Marion Langdon is buried in the Langdon Family Cemetery in Harnett County, North Carolina along with his wives, Susan Elizabeth Denning Langdon & Sally Ann Cobb Langdon. Joseph Baxton Langdon is buried there as well. Carrie Langdon Pleasants & Margaret Ethel Langdon Parrish ca. 1925 Daughters of Joseph Marion & Susan Elizabeth Denning Langdon. Children of Joseph Marion Langdon ca. 1960 Front (L-R) Carrie Langdon Pleasants, Julia Langdon Pleasant, and Ethel Langdon Parrish. Back (L-R) James Allison Langdon, Sr., Lexie Langdon, and Delma Langdon. Gertrude Benson, Merchant Langdon, & Estelle Parrish ca. 1935 Gertrude was the daughter of Lundy & Eliza Parrish Benson. Merchant was the son of James Allison & Alice Pleasant Langdon. 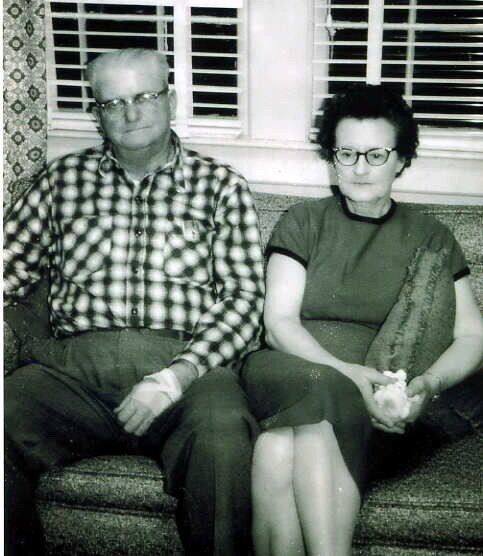 Estelle was the daughter of George Leonard & Eula Honeycutt Parrish and became the wife of Merchant Langdon. JM & Martha Smith Langdon ca. 1930 Joseph Marion Langdon & third wife, Martha Smith Langdon. Daughter of Isaac Smith. Joseph Baxton Langdon ca. 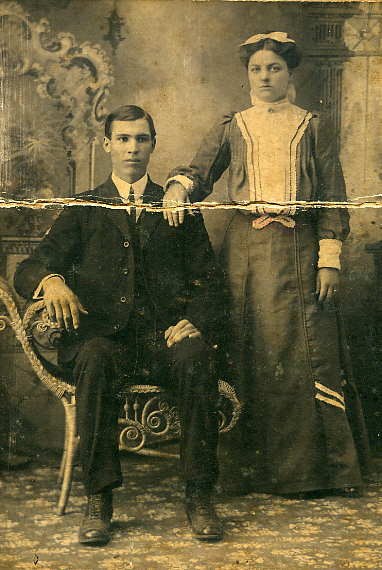 1906 Son of Joseph Marion & Sally Ann Cobb Langdon. Joseph Marion Langdon ca. 1906 Son of Britton Langdon, Jr. & Margaret Delaney Adams Langdon. Husband of Susan Elizabeth Denning. 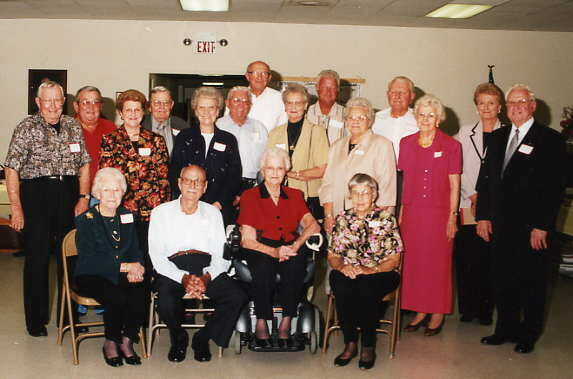 Joseph Marion Langdon Grandchildren 2004 (L -R) seated: Rebeth Mitchell, Alton Pleasants, Brookie Tripp, Christine Pleasant / standing: Willard Pleasant, M. B. Pleasant, Doris Barnes, Joe Pleasant, Marva Lee Whittington, J. A. Langdon, Smith Langdon, Marie Stephenson, Don Langdon, Joyce Carter, Daywood Langdon, Sue Ogburn, Sue Johnson, and Raeford Parrish. Not pictured: Olene Book, Berlene Ennis, Clyde Pleasants, Pearl McRoy, Rachel Peterson, and Brenda Langdon. Joseph Marion Langdon & Grandsons ca. 1922 Joseph Rupert & Eddie Raeford, twin sons of Eddie Lester & Margaret Ethel Langdon. Margaret Ethel Langdon Parrish ca. 1910 Daughter of Joseph Marion & Susan Elizabeth Denning Langdon. See Parrish Family Photos for more. Mary Ida Langdon Stewart ca. 1905 Daughter of Joseph Marion & Susan Elizabeth Denning Langdon. Wife of William Walter Stewart. 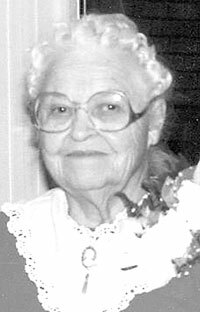 Julia Frances Langdon Pleasant (11/29/1889 - 3/22/1965) was the daughter of Joseph Marion & Susan Elizabeth Denning Langdon. 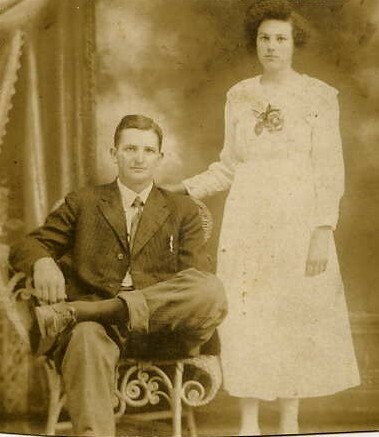 On Valentine's Day, 1909, she married Marion Benton Pleasant, son of Joseph James & Sarah "Sallie" Stephenson Pleasant. Julie and Benton had 10 children. Irving Lassiter Langdon ca. 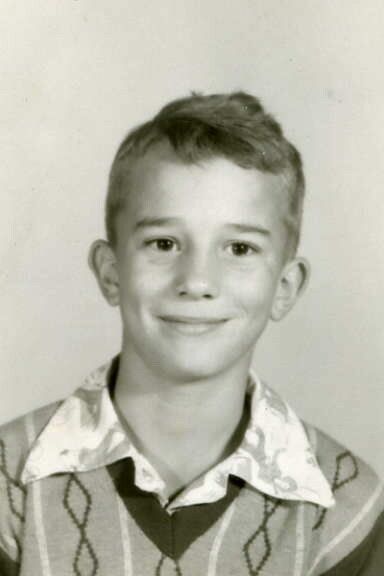 1950 Son of Lloyd Roger & Ruth Lassiter Langdon. 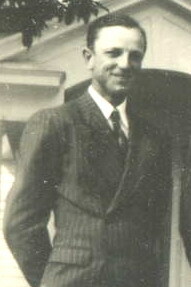 Husband of Lela Gladys Pleasant Langdon (daughter of Marion Benton & Julia Langdon Pleasant). Leola Frances "Billie" Pleasant ca. 1926 Daughter of Marion Benton & Julia Langdon Pleasant. 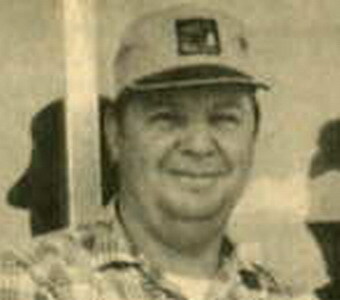 Marion Benton Pleasant, Jr. ca. 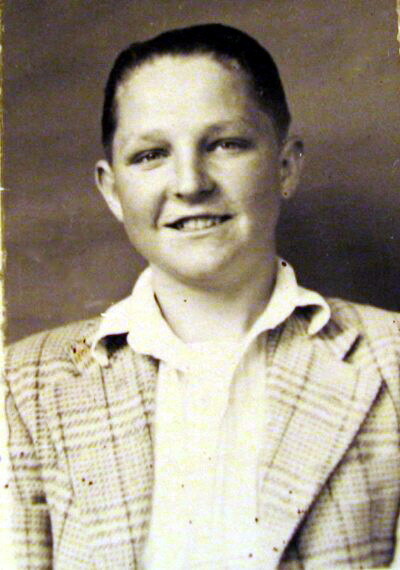 1947 Son of Marion Benton & Julia Langdon Pleasant. Susan Gertrude Pleasant Ogburn ca. 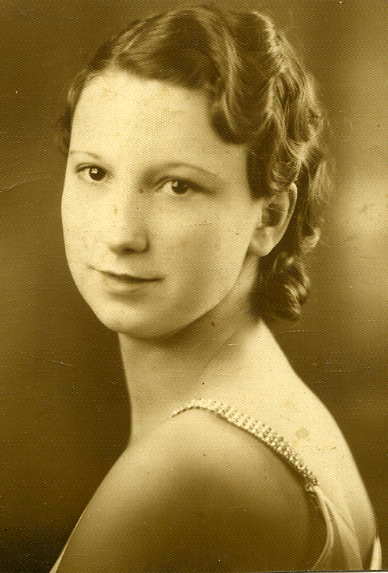 1942 Daughter of Marion Benton & Julia Langdon Pleasant. 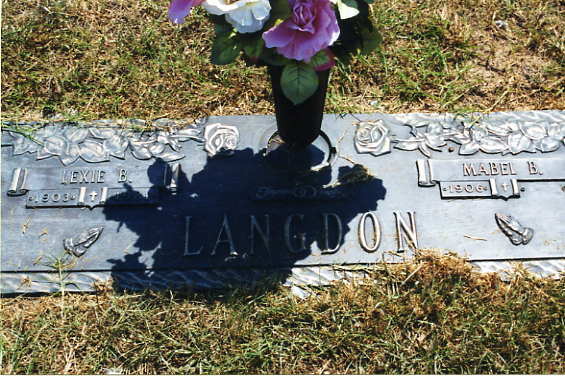 Lexie Britton Langdon ( 7/2/1903 - 3/26/1981) was the son of Joseph Marion & Sally Ann Cobb Langdon. On 12/24/1925, he married Mabel Barnes (9/12/1906 - 1/27/2003), daughter of John Lewis & Flora Catherine Weeks Barnes. They raised 3 children together. Lexie & Mabel are both buried at Lakeside Memorial Gardens in Harnett County, North Carolina. 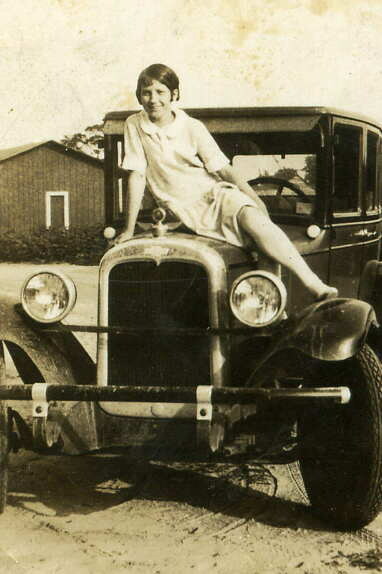 Fannie Sue Langdon 1934 Daughter of Lexie & Mabel Barnes Langdon. Lexie Langdon & Children ca. 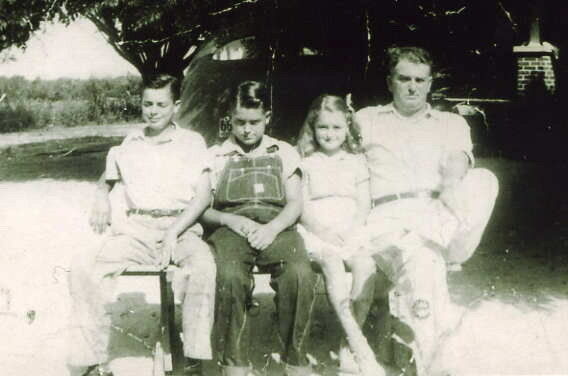 1940 (L -R) Cecil Edward, O'Max, Fannie Sue & Lexie Britton Langdon. O'Max & Cecil Edward Langdon ca. 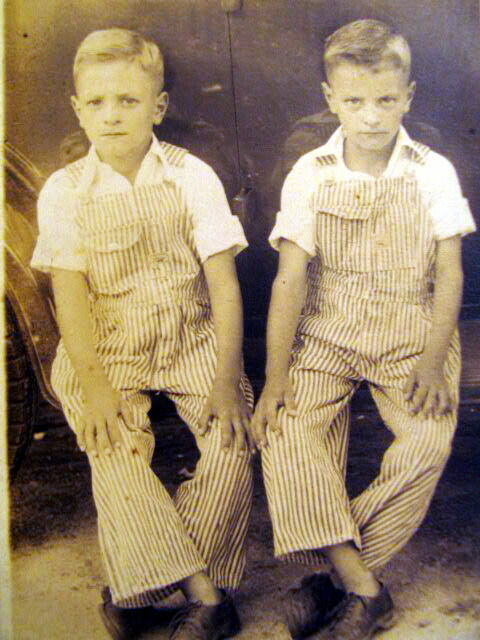 1933 Sons of Lexie & Mabel Barnes Langdon. Mary Ida Langdon (9/1887-1921) was the daughter of Joseph Marion & Susan Elizabeth Denning Langdon. She married William Walter Stewart on 12/17/1905. They had 6 children together, 2 of which died as infants. 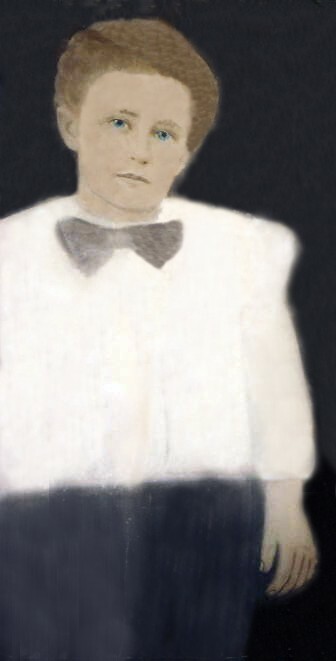 After Ida's death in 1921, Walter married Pearl Lee. Carlis Stewart ca. 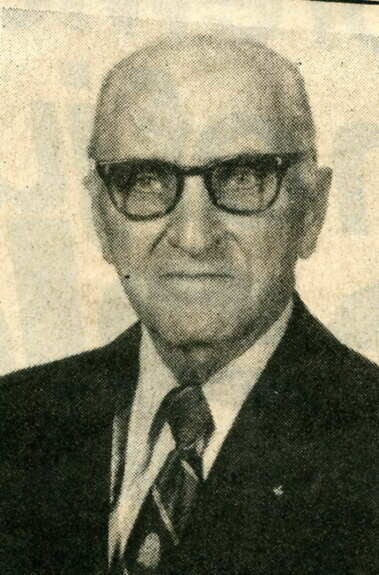 1968 Son of William Walter & Mary Ida Langdon Stewart. Pearl Stewart ca. 1930 Daughter of William Walter & Mary Ida Langdon Stewart. 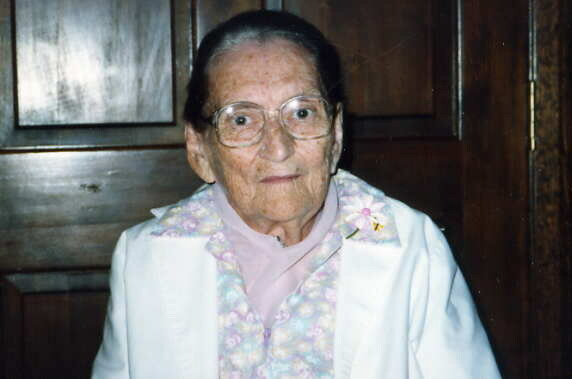 Pearl Stewart McRoy ca. 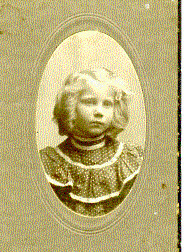 2000 Daughter of William Walter & Mary Ida Langdon Stewart. 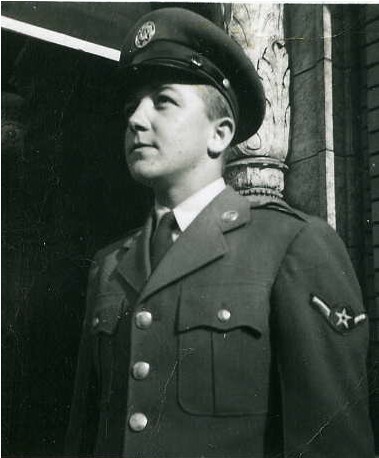 William David McRoy, Sr. ca. 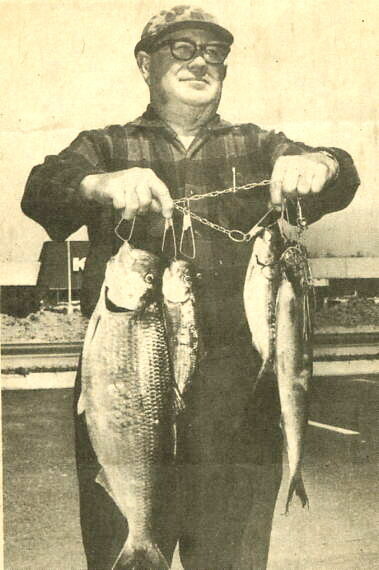 1960 Husband of Pearl Stewart McRoy.